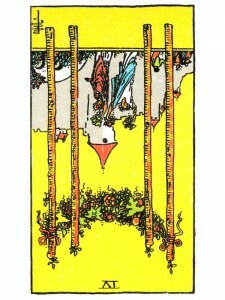 Four of Wands (R) says that you should try not to be so impatient and narrow-minded. If you wish your aspirations to become attainments, they need to be accompanied by will-power and a concentrated focus on your goals. Be thankful for your blessings – you will always see positive improvement, even from a negative situation if you will just keep trying. If you care – be willing to show it and be thankful for what you have. Take your mind off the so-called “big” things and learn to appreciate the things that really matter. Joy is so powerful it can not be blocked – but stress and problems can “cloud” it so that it is not so obvious. This creates a need to learn to appreciate what you have. Happiness in your environment can be strong, while still considered unorthodox in terms of other people’s attitudes and expectations. A lack of pause – of respect and of understanding in correct measure for your status/progress, for you are too caught up in the physical, emotional, mental aspects of the moment. Not properly observing, celebrating, giving thanks. An inadequate performance, according to the responsibilities of your spiritual position. Inadequate/improper use of spiritual position and/or knowledge. What role is ritual or ceremony playing in your life? In the first position: As people profit by being near you, it may be difficult to guard the time you need for yourself. Ritual and observation may become forces to be reckoned with. In the second position: Material resources come with this spiritual path. Neither become overly dependent on these resources in your spiritual community, nor be remiss in not taking advantage of them when you need them. In the third position: Do not be negligent in your observations. Your spiritual meditations and rituals are very important – especially at this time. Do not overfill your life with unnecessary or empty formalities. In the fourth position: You may be drawn to the abstract trappings of faith more than to the underlying truths and the demands they make on your soul. Ritual, spiritual practice can easily deteriorate into self – serving, empty operations. They are not ends in themselves. In the fifth position: You know that something just doesn’t quite fit with everything else. Or, the fact that everything appears to be perfect is what troubles you. You may be questioning your alignment with others in spiritual matters. One possible dilemma: Have you joined the right group? Is it you or the group? In the sixth position: How do your practices affect your relationships and vice versa. Spiritual integrity can create enormous pressures on families and groups. Practices must not be imposed on those not ready or willing. In the seventh position: There may well be growing pains within you or within your fellowship. Guard against the pitfalls of spiritual vanity. Neither be complacent with your spiritual status, turning your back on further growth while presuming you hold the truth everyone else should observe, nor rush too quickly ahead of your foundation into new and uncharted waters without your spiritual lifeline. In the eighth position: There may be too much or too little celebration, observation, ritual. You may be trying to convert unnecessarily your entire Physical Plane into the spiritual, even to make your living on line in spiritual endeavors. Remember that everything contains the spiritual. In the ninth position: The heart is confused, for it is not rejoicing when in fact it should be. In the tenth position: Grace will intervene to help center this archetype. Seventh position – “…without your spiritual lifetime” — I believe that should say “without your spiritual *lifeline*”. Wow these all hit extremely accurate.So Enlighten me please I’m truly feeling as lost as Alice ,and As Mad as the Hatter…So give me the gift of how to fix my issues.I broke my spine in 2015 .I lost everything .Seems like I’m paying for All my wrong Doing .And Karma is hitting me hard ,Not to mention I see so many having done Worse things in there life.And ,I honestly feel as if I am cursed.So Now what??? ?I’d really appreciate it if you could give me real solutions and ,Ask Karma to um think.Maybe I have paid my dues and then some.So please ease up.Before I loose my head .As the Queen of hearts would say off with my head Ok just hurry up as painless as possible and get it over with.Or ,Maybe bring me some peace tranquility and ease my pain .Also it’d be nice to have a home.to live in that I can afford and maybe I can get to being that wonderful person Who .Thinks if my glass has a little water I’ll at least not go thirsty.And really appreciate it I could get some relief from this pain that I’ll have til My Life expires. Fourth paragraph from end, “…nor rush too quickly ahead of your foundation into new and unchartered waters without your spiritual lifetime.” Seems the appropriate final word should be “lifeline”, because this word better matches the “uncharted waters” symbolism. Additionally, I believe the word is “uncharted” not “unchartered”. I very much appreciate your thorough insight into the cards, especially the reversed ones.